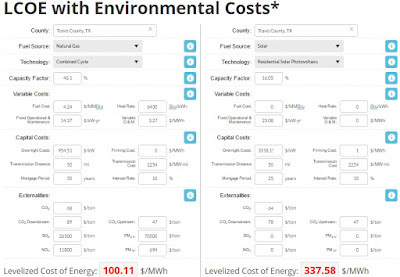 Natural gas and wind are the lowest-cost technology options for new electricity generation across much of the U.S. when cost, public health impacts and environmental effects are considered, according to new research released today by The University of Texas at Austin. The paper is part of a comprehensive study coordinated by UT Austin’s Energy Institute titled the “Full Cost of Electricity (FCe-),” an interdisciplinary project that synthesizes expert analyses from faculty members and other researchers across the university — from engineering, economics, law and public policy. The research team adopted a holistic approach to probe the key factors affecting the total direct and indirect costs of generating and delivering electricity. Their work resulted in the production of a series of authoritative white papers that provide an in-depth assessment and examination of various electric power system options. Researchers categorized the electricity system into three principal components: consumers; generation technologies; and the wires, poles, storage and other hardware required to connect end users and generators. Taken as a whole, the white papers assess the interaction among these three components, as well as costs often considered external to the electricity system, such as environmental effects and public health impacts. For the white paper on power generation costs, researchers used data from existing studies to enhance a formula known as the Levelized Cost of Electricity (LCOE). In addition to including public health impacts and environmental effects — which the LCOE typically does not — the research team used data to calculate county-specific costs for each technology. 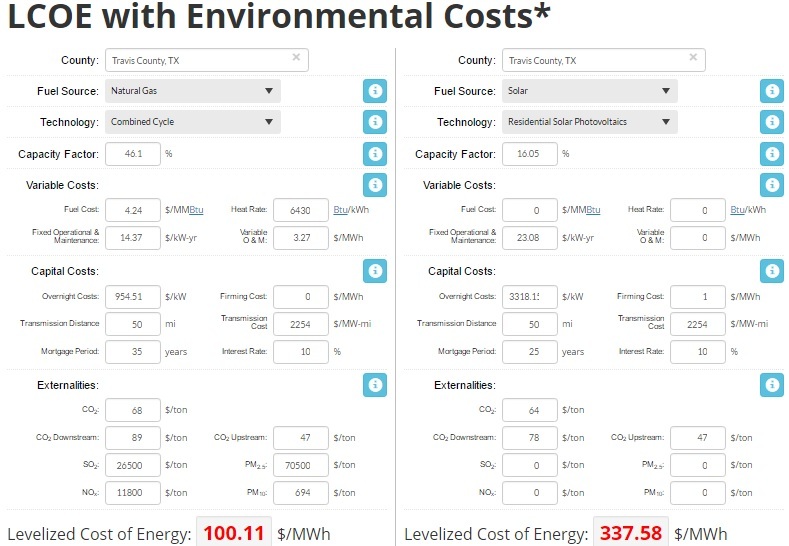 The team also developed online calculators to facilitate a discussion among policymakers and others about the cost implications of policy actions associated with new electricity generation. Dr. Joshua Rhodes, postdoctoral research fellow at the Energy Institute and lead author of the paper, said the cost estimates are based on a series of assumptions that researchers debated at length. “We think our methodology is sound and hope it enhances constructive dialogue,” Rhodes said. “But we also know that cost factors change over time, and people disagree about whether to include some of them. “We wanted to provide an opportunity for people to change these inputs, and the tools we’ve created allow for that,” he added. Researchers analyzed data for the most competitive sources of new electricity generation. Wind proved to be the lowest-cost option for a broad swath of the country, from the High Plains and Midwest and into Texas. Natural gas prevailed for much of the remainder of the U.S.; nuclear was found to be the lowest-cost option in 400 out of 3,110 counties nationwide. Depending upon the existing capacity of the grid and incremental quantity of generation added, transmission interconnection costs for new generation can be negligible to significant (e.g., 0-600 $/kW in ERCOT). No power plant (ultimately) has zero interconnection costs. All grid-connected power plants depend upon transmission and distribution to deliver electricity to consumers. The costs of building and operating the grid are non-trivial at 700-800 $/yr per customer, or approximately 3 cents/kWh. The current long-term forecast ... indicates that the market expects natural gas prices to remain relatively low (under $4.35 per Million Btu) through 2025. In general, renewable energy sources such as utility-scale solar and wind energy require more bulk transmission system expansion because the best wind and solar resources tend to be located further away from electric load. As an example, the bulk long-distance renewable transmissions lines used to connect the Electric Reliability Council of Texas’s (ERCOT) Competitive Renewable Energy Zones (CREZ) in north and west Texas costed approximately $6.9 billion in total, or $600/kW, which is more than conventional greenfeld and brownfeld generation projects. The circuit topology is a very decisive factor as the “Range 1” PV hosting capacity varies greatly depending upon the circuit (e.g., from 15%-100% of peak load for three analyzed circuits). Even a circuit that necessitates smart inverters on all PV panels to enable PV to reach 100% of peak load can do so at modest cost (e.g., 0.3 $/W additional). To contextualize the costs associated with increasing the PV hosting capacity of Circuit C ..., we calculate the investment required to increase hosting capacity on a $/W basis. Increasing the number of tap change operations at the substation transformer increased the hosting capacity by 5.4 MW (~ 30% of peak load) at a cost of $0.0007/W. Replacing 10% of solar inverters with smart inverters increased hosting capacity by an additional 3.7 MW (~20%) at a cost of $0.06/W. And replacing an additional 20% of solar inverters with smart inverters increased hosting capacity by an additional 1.6 MW (~ 10%) at a cost of $0.3/W. All of these costs are at least an order of magnitude less than the typical 2014 cost for a residential roofop photovoltaic system of approximately $3/W . The average rate of electricity ($/kWh) is only one part of the story in thinking about energy costs to low income households. The average rate charged for electricity in 2009 was practically the same (at approximately 0.128 $/kWh) for Texans overall as compared to low-income (<$25K/yr) Texans and energy-burdened Texans. year. Thus, energy-burdened Texans consume almost the same amount of electricity than does the average Texas household. According to the EPA, each premature death in the U.S. is valued at more than seven million dollars. Total federal financial support for the electricity-generating technologies ranged between $10 and $18 billion in the 2010s. Support was highest in 2013 due to one-time American Recovery and Reinvestment Act (ARRA) related funding. Excluding this temporary source of funding, electricity support totaled approximately $7 billion in 2010 and could rise to $14 billion in 2019 according to some estimates. The growth in perennial spending is attributable to renewables, especially wind. The total value of all federal financial support for the fossil fuel industry is comparable to that spent on renewables. When considering only the portion of fossil fuel subsidy that relates to electric power, however, renewables receive a greater share. When considering total electricity-related support on a $/MWh basis, renewable technologies received 5x to 100x more support than conventional technologies. Generation from fossil fuels receive a large amount of support, but their per-MWh cost is modest due to the very large installed base and the high quantity of generation. Renewables, by contrast, receive somewhat more money but generate significantly less electricity. Depending on the year, fossil fuels and nuclear receive $0.5-2/MWh. Wind received $57/MWh in 2010 (falling to $15/MWh in 2019) and solar received $875/MWh in 2010 (falling to $70/MWh in 2019). Overall, electricity technologies receive financial support worth $3-5/MWh. As generation from renewables grows, the $/MWh diﬀerential between renewable and conventional technologies is forecast to decline.